The æternity Crypto Foundation (Liechtenstein) just announced a monthly donation of 1000 AE to be spent on tips to support valuable contributions to the æternity ecosystem and stimulate positive interactions between community members. If you believe that you have done something worthy of a tip, please announce it below! 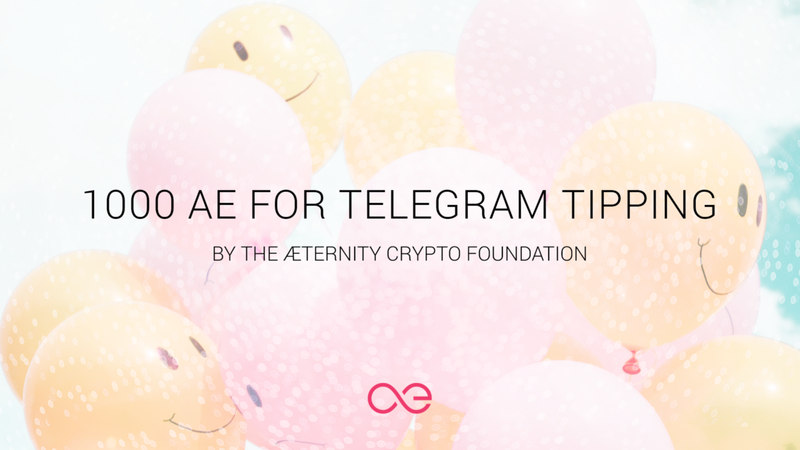 All tips will be distributed via the Telegram TipBot in the main æternity Telegram channel. great initiative! I think the development of our aepp-sdk-java deserves a tip. AEKnow and Kryztoval already received rewards for their work! AEknow -> 3000 AE (as a bounty) and Kryztoval - 200 AE (tip). I am not sure who is the creator of the Java SDK. What are your telegram handles? You know that you can find all that information here in the Forum, right? It is for new users. It is hard to find info here. And even for me, has been on the forum for months, is hard to find info I want. Tell us what we should highlight - what information exactly you have hard time finding? You have made your point clear in Twitter and in the Forum. Everyone is painfully aware about the need to update the website and that is happening. Please try to stay on topic and refrain from spamming the channels. 1000 AE Para Propinas en Telegram! Vanessa is doing a great work at the Spanish Telegram channel. Tip Vanessa. Thanks to you Vanessa. I really appreciate you work at the Telegram channel. I don’t know the work of other people. But I am sure you all deserve bbe tipping. I believe it’s really useful for the onboarding process since there are many specific terms used only within the æternity ecosystem. I will continue to expand this to not only cover more terms, but to also go further in-depth in each section and to add more interactivity features where possible!